Caught reds and black drum in the current fishing passes in Point Au Fer Island. Slammed several reds this morning. Some ducks from the weekend. 9 year old's first duck. Bluewing Teal. What a blast. My boy had a blast in Colorado fishing in some still waters off the White River. Here is his "hog" Rainbow Trout. It's not the biggest one he caught, but it's the biggest one he landed. AWESOME job Bubba ! ! ! Just a few pics from an outing this morning with the family. We broke in two first timers this morning. First redfish for the wife, and daughter. Wife caught a nice 24 incher and 4 others, Son caught a limit, daughter caught a few, and I caught a couple. Here's a pic of a huge Black Drum I caught in nearly two feet of water. Here are some pics of my son's first fishing trip for inshore redfish. We fished Atchafalaya Delta WMA. I need to know who does nice work on fish mounts near Morgan City. I say this because any season I am able to go hunting is a perfect season. Shot more ducks this season than last season, but it's been awfully slow for the last several years in the marsh below St. Mary Parish. Last season 1 Widgeon Hen. 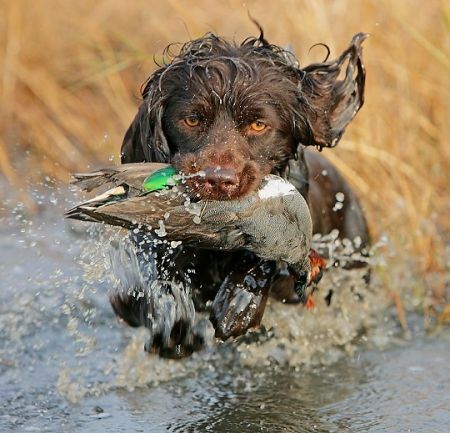 This season, Two Mallard Drakes and a Bluewing Hen ! ! ! What a hoot. My family was invited to hunt and fish private land in Baton Rouge this weekend. My hat goes off to Keith and his family for opening his home to my family. We fished from the time we got there in the early morning and caught bass and sacalait. We were still fishing when the dinner bell rang for grilled fresh sausage and ribeyes served with some of the best smothered potatoes EVER. After lunch, Lucas and I threw the football for quite a while because he wanted to work on "catcing the ball with his hands".........(most 8 year olds would have been in the house on the x-box or Wii, but not mine, he wanted to spend some time in the outdoors with his dad.........the wife and daughter were stuck on the fishing lake all day. When it was around 4:00PM, the call came to get set up for dove hunting. WHAT A BLAST. My son and I made our first dove hunt together and it was awesome. He got to finish off a cripple with his H&R Topper Classic loaded with 20ga #8s. We got home just in time to see the second half of the Tigers/SC game. Nice finish to a wonderful Saturday fishing, hunting, and catching the game with my family. We're truly blessed. I started hunting with my best friend and his dad when I was 15. We had plenty hunts with other friends as well and they still stick in my mind as if it was yesterday. Waking up early and eating 'pip tarts', drinking water from that COLD aluminum cup on the back of the Anna Lee. Shooting the 22s after the hunt to pass the time before the afternoon hunt, and so many other memories. Dr. George and PawPaw Broussard assigned me to my own blind on the lease when I was 20 or so and told me NO GUESTS and that if I wanted to take a guest, I could get a dog to bring along!!!! When I realized that I was going to be going down to the lease and hunting on my own, now that I had a blind, I bought a lab. Jessie was a great little chocolate lab that had as much heart as any for the hunt. Dr. George let me borrow his aluminum fishing boat to take to the lease and back. I took PawPaw Broussard hunting with me fairly often. We loved it. I believe he quit coming out with me when he was in his early 70s. He would call ducks with the seriousness of any true hunter and after we would shoot, he would laugh out loud out of sheer enjoyment of what had just happened. Whether we hit or missed, he would laugh aloud because he had such a passion for hunting ducks that his love for the sport was nothing but contagious. He would encourage me to try and call ducks and would say that it sounded like a duck now and then to build my confidence. Whether it sounded ducky or not, he always encouraged me to keep trying, giving me subtle pointers along the way. PawPaw Broussard always had a story to tell when the shooting was slow. Sometimes he would tell the same story, but it was still interesting because he was taking time to show me what duck hunting was all about. I had enough respect for him to sit there and listen and laugh and enjoy the whole experience. I was there for the experience. I used to hunt for a certain species and gender of duck to make the hunt a challenge. One weekend I would shoot only Gadwall drakes, one week only Widgeon drakes, one week only Greenheads, or Teal, and the list goes on. I would shoot a hen now and then, but I got better as time passed. Often, when the hunt was over and I would paddle the pirogue around the 600 plus acres we had just to see the sights. Ducks, Nutria, Eagles, Otter, Beavers, Alligators, Snakes on occasion, we had it all. PawPaw Broussard passed on a few years ago and although I loved my grandfather dearly when he was alive and learned a lot about other things, I had a big enough heart to embrace and cherish each moment I was able to share with PawPaw Broussard as well. A legend in my mind and truly missed. I remember this post. Anything different with DU? What are your opinions on hunting guides that hide birds with bands so that they can get the band? I know all of them don't do this, but I've heard of plenty of them that do. I personally disagree with their thinking that they are "due" the band because it's them that puts the hunters on the birds, and it's them that do all the work before the hunt. Personally, I think that it's the trophy of the shooter in all situations and it is up to him or her to decide whether to allow the guide to have it or to keep it. I've had guests shoot banded birds on my lease many times in the past and it was not even a consideration for me to "take" the band. I was proud that they were able to shoot a trophy on my place. What do y'all think? I want to hear from guides and outfitters on this one too. If guns kill people, pencils cause mis-spelled words. I thought it was a resonable statement. Thought I'd share it. We had several shots, but few hits this morning. Two Wigeons and that's it. We were picking up and as usual, two flocks of Mallards came in, so we had to get the guns out of the cases and reload while I called 'em in. A few broke off of the larger flock and gave us some shots, but busy calling, I wasn't loaded, one gun jammed, and the other gun missed. Fun hunt, as usual. Ate the ducks for lunch butterflied pan seared duck breast. The kids ate it up. Chasu had a blast as well. GOOD BOY ! ! ! Here they are again. All of these deer were purchased from Antler Ranch outside of Fort Worth Texas. Don't know where they were shot, but they were purchased from Antler Ranch, a breeder ranch well known for their HUGE racks. When he was a little boy, his grandfather "Hatch" was hunting with other family members on their property. After hunting, they were coming out of the woods where they were met by a few men that were hunting on the neighboring property. One of the men approached "Hatch" and asked if they could hunt on his land. He said no a few times, but they were persistant. Finally one of the men told "Hatch" that if he would let them hunt their land, that they would pay all of the property taxes, so he agreed with a handshake. Times were hard back then, but there were still some that had plenty enough money and hunted or fished for sport. My family farmed and hunted their land for food and trade in that area since 1830. One day, "Hatch" got a notice from the state that "his" land was being seized and he had so many days to come up with the money owed for past due taxes. Well, to say the least, he didn't have that much money so the land was seized and offered to the neighbor for amount of tax due. The "men" that approached my great great grandfather were ancestors of the people that currently own the area that is now called Lake Hatch Oil and Gas Field and Mandalay south of Bayou Black, LA near Houma. I've heard a few similar stories after telling friends about how we used to have all this land and it was legally stolen by smooth talking people that would take advantage of uneducated hard working folks. My family had been robbed of it's land claim and there was nothing they could do about it. I feel that part of my heritage has been stolen and there's nothing I can do about it. I write this because I had to accompany an employee to the doctor's office that is owned by a descendent of the person that "stole" the land from my great great grandfather. He has numerous pictures of hunts with his family, children, grand children, friends and clients. Around every corner were pictures of deer, ducks, and a bunch of smiling faces. It made me want to walk out of that office, but I knew that he had nothing to do with what happened back then, so I just sucked it up. I guess it's the hand I was dealt, but I sure would like to have some of that back to take my kids to and show them where their great great great grandfather used to hunt and fish. The link above is to a deer anatomy site showing vitals and "not so vitals". It was pretty interesting. Check it out. I was able to fill my "non-resident" tags in WV over Thanksgiving week. I was allowed one buck and one doe. I saw the only bucks the entire week and took my first buck, a fairly young 6pt that was estimated at 151 lbs. It was 122 field dressed. I saw three bucks and 6 does on Monday for the opener and 5 does Wednesday. All together I shot my buck and a doe, the landowner shot three does and the other hunter busted the week. We were giving him a hard time because he was bringing a book to the stand and reading while up in the stand. This was not the best way to hunt deer, but at least he had fun. I was able to choose the largest buck because he was at the back of the pack that came through around my tree Monday morning. When I heard him coming I turned around and I think he saw me move, but could not figure out what was happening. As soon as he stepped out from behind the thicket, the 270 did it's job. The doe I shot Wednesday was browsing the ground with 4 others that had wandered into range while searching for acorns. We had a great week visiting some friends and was able to spend some time in the woods as well. Bass Fishing is on for the kids. My son, daughter, and one of their friends have been catching bass and having a ball. Y'all should see my boy cast a rod at 6 years old. Here's some pics. There is a root cause. July 1995 Ducks Unlimited magazine explained it in full detail. It is the efforts of DU, EPA, and land owners that commit at least 15,000 acres each to the program. I can't recall the name of the program, but it is in the interest of preventing soil erosion. The claim is to prevent pollution from soil erosion and rainwater runoff from entering waterways in the flyway, DU gave plans to EPA and they got something like 200 land owners investing no less than 15,000 acres each to build levees, pump water, circulate water within the individual levee systems, provide food for migrating waterfowl, and creating an environment where ducks are prevented from the natural inclination to fly farther south for warmer water and food sources. If they have water to land in and food to eat, they have no reason to continue the migration. They only migrate based on need. Louisiana is no longer 'needed' by waterfowl because DU in Arkansas, Missouri, Illinois, and Iowa have influenced the migration by providing everything ducks need to stay there, but at least the streams and waterways aren't being polluted by water runoff from croplands. SMH. DU is the problem for Louisiana ........... PERIOD ! Very nice ............. Those small catfish with fins are my favorite fried crispy !!!!! That's exciting Ricky. I hope Lucas gets picked for the youth hunt this year. We haven't heard back from the DWF just yet. 'love don't pay the rent, JACK' haha I love the show. The whole family can watch it and remain entertained from beginning to end. HaHa. I love it. 'But I won't' Excellent. A comment titled: Depends on her age and size in response to a report titled: insight? My son shot one since he was 8 years old and it kicked the snot out of him so much that when he graduated to the Youth Pump, it was a relief. He hated it. The pump guns are a little heavier and kick a lot less. If your fishing inshore i don't see any reason to purchase a $1000 stella, but i can tell you we have two of them we use to tuna fish and they are awesome. I think the biggest difference is the drag system. When we purchased them i asked the people at Professionals ' y buy a $1000 stella when i could get the same size PENN for $400' that's when they showed me the difference in the drag. Sportsman's Fabrication 20x6 22' bow to motor and 8' beam. Nice trip Ricky and Bubba ! ! The late tides messed us up yesterday for PAF Island and Oyster Bayou, so we grilled and hung around and played with the kids in the pool all day. My Boston Whalers had wood, but there was a piece of mind that they were built right. My Key West had no wood and still piece of mind that there would be no rot in the transom. My boat that I hope is my last: Sportsmans Fabrication 'Aluminum' with floatation. It's sprayed in by Craig Ring at Gator Liners in Morgan City, LA. He did several of these over the years before he perfected the technique, but he's gotten it down to a science now. He did an excellent job. It's textured and not slick at all. The color of mine is light gray. I really like it. I've had Hanko's, Scully's , and Sportsman's Fab custom boats. They are all good. I currently own a Sportsman's Fab bay boat. It's the best one I've owned to date. What else is there to say ! ! ! A comment titled: Pen Raised Mallards in response to a report titled: Pen Duck Hunt? I know Diamond W Ranch closed about two years ago. Did someone reopen it? The old manager is Scott Ritchie with Louisiana Outfitters. I want to say that the old owners sold to a bunch of foreigners and they shut the place down. I'd love to go back if they're open again. A comment titled: Thief in response to a report titled: Thanks !!! When 'NORMAL' people pass by an object that they didn't put there, we should know that someone has put it there for a good reason.......leave it alone. Please, don't give these thieves the courtesy of being called outdoorsmen or sportsmen because they're not, they don't live up to the standard. Just because I can fit in my garage doesn't make me a car, so to say that what they do outdoors makes them an outdoorsman is far from the truth. I did sense your sarcasim, so I get it. I have a word: TRASH. We've had pirogues, decoys, boat, motor and trailer stolen in the past and the trash that does it will get theirs.......someday, they'll get theirs. I've hunted in the marsh on private land for 29 years and I have to say that leaving the decoys on the pond will NOT distract ducks. The only drawback to leaving them on the pond is that if the wind changes direction, or if the water rises/drops, you may have to pick them up and move them to another blind location. I've left decoys around the blind all season in the past and we've never had a problem. In fact, one afternoon I fell asleep in the blind and woke up to something hiting the side of my boat. I about pee'd my pants when I heard the sounds of feeding ducks and saw 4-500 ducks on the pond, and in my decoys. They were eating snails off my boat and the brush, and even the decoys. Yep, they were plucking snails off the decoys. Some discourage it, but on my lease, no worries if they're set up right. I've left them out all split several times. I use cane and cedar to make duck calls. I hope to be able to make about a hundred this year. Buy cedar fence boards and rip them on a table saw to 1/2 inch strips. Cut them 2 1/2 inches long and sand them to remove the roughness. Mark with a straight edge where you cut the groove and leave about 1/4 from the end. Gouge with an xacto knife if you want to do it all by hand like I do. You'll split several until you get the feel for how much pressure you can put on the blade before it breaks and then it's sort of simple. You can use old combs, toothbrushes, mylar sheeting, vinyl acetate, and so many more for the reeds. I use copper pipe for the band in mine to prevent splitting of the bamboo when you stick the stopper in the barrel. My calls have a very traditional look. You can see some of mine at this link. A comment titled: Duck ID in response to a report titled: duck i.d. Awesome buck. That deer was in that place at that time for only one purpose. Your son't first buck ! ! ! Hunting ducks passionately since 1982.